I dislike not having an alternative with boat systems. Two water tanks; two toilets; two forms of heating, two energy sources, etc. However when it comes to our communications we allowed the monthly contract for the internet usb dongle to lapse as the monthly contract only had a small data allowance and, frankly, it was expensive. Our sole means of communication is the Samsung Galaxy S1 phone which has the functionality to provide voice calls and ‘tether (act as a wireless internet router). My concern is that should the phone fail we will have no means of communication. The Samsung was chosen because it had an external aerial socket which enables us to connect the phone to the powerful mobile phone aerial on the cabin roof. So some time ago I decided we needed a backup (spare) phone for the day when the current phone fails. Finding a phone with an external aerial socket can be difficult so I decided to stay with Samsung. We could purchase a new phone on a monthly plan, but I dislike the idea of being financially committed to a specific provider for an extended period. Of course time passes and phones get superseded. 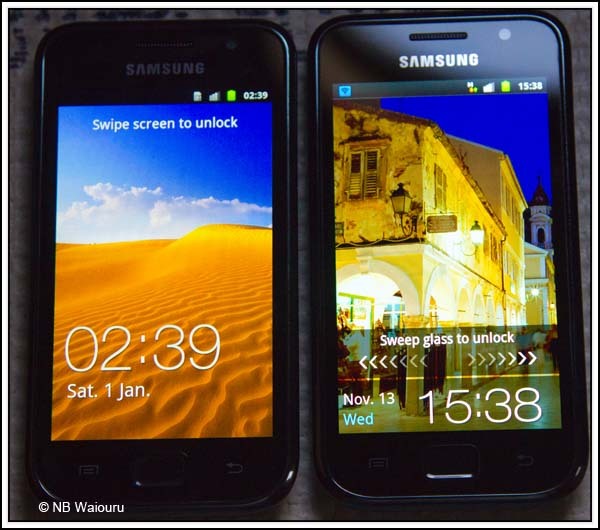 The Samsung Galaxy S1 has been replaced by the S2 then S3 and now S4. New phones usually have more functions and different applications; most of which we neither need nor want. What we need is a new Samsung Galaxy S1. Finding a ‘new’ phone of a model that has already been superseded four times is difficult. They start to become rare and eventually become a collectors item actually rising in value rather than falling. Therefore the strategy has been to watch the price of S1 phones and judge when they have reached their lowest price, then buy! The strategy appears to have worked as we have been able to buy an S1 at a price less than 25% the cost of a new S4. We now have two phones of the same model. The new phone needed to have its settings adjusted in order for it to act as a wireless router. sometimes this automatically occurs when first switched on but I discovered on arriving in the UK with the original phone it was better to know the manual configuration settings. I have found the following settings work on an Android phone using the Three network. This next part is boring if you don’t have an Android phone with Three UK as your provider. Removing the propulsion diesel tank gauge sender unit and returning it to the manufacturer for repair. Wire brushing down the flaking paint and rust in the engine bay and repainting. Fitting a waterproof 12v socket in the cockpit for the navigation unit. Meanwhile Jan made the slow gin and has also made a start on the rosehip syrup. I knew the S2 had the external aerial socket, but not the S4. So thanks for the information. I guess you found Telco in Australia sells the patch lead. I didn't want to go to the expense of purchasing an S2,3, or 4 when the S1 does what we need!